Bus from Penang to JB is used to be one of the most sought-after bus services. Reasons are because taking bus from Penang to JB is budget, having more frequent schedule, and convenient. Konsortium, Season Express, and BillionStar Express are the few bus operators who provide comfortable bus from Penang to JB. Why Take the bus from Penang to JB? Service for bus from Penang to JB stays strong in market even after launching of AirAsia budget airline service from Penang to JB. One of the reasons is because taking bus from Penang to JB arrives in Larkin bus terminal in Johor Bahru, which is in Johor Bahru city centre. Comparing to taking flight from Penang to JB, arrival at Johor Senai Airport is about 30 minutes away from Johor Bahru city centre. Undoubtedly, it is more convenient for passengers by taking bus from Penang to JB with arrival at city centre Johor Bahru Larkin bus terminal. Besides that, budget and commercial airline ticket fare is 2 times or sometimes 3 times more expensive than bus ticket fare. If you manage to book the budget airline ticket during limited promotion period, you may get air ticket with fare similar to bus ticket fare. Thus, cheaper bus fare is another attraction for passengers. In additional to that, travellers can save their precious day time by taking by bus from Penang to JB at night. After sleeping through the night, one will be arriving Johor Bahru in the morning. By travelling at night, it should make the 10 hours journey look shorter. The bus fare for bus from Penang to JB is about RM 57.00, except during the festive period like Chinese New Year and Hari Raya Haji. By comparing the flight ticket fare and bus fare, bus fare is always much budget. The duration for bus from Penang to JB usually takes about 10 to 12 hours, depending on traffic condition. Usually travelling in day time by bus from Penang to JB takes slightly longer time due to heavier traffic in day time along the journey. Most coaches provide at least 1 washroom break along the journey. If additional washroom break needed, passengers can always speak to the driver for additional stop. Please note that all coaches departing from Prangin Mall Komtar will go to Sungai Nibong bus terminal to pick up other passengers before heading to Johor Bahru. Also, some buses will drop off passengers at Pudu Sentral Kuala Lumpur before continuing the journey to Johor Bahru. 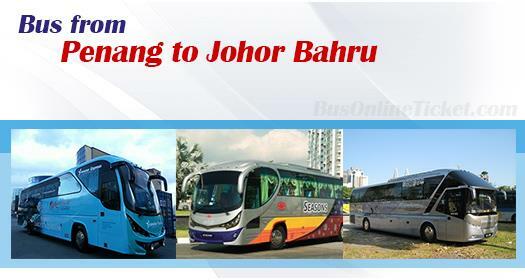 Booking Penang to Johor Bahru bus ticket in BusOnlineTicket.com is convenient, simple and secure. Payment options like Paypal, Visa and Master credit card, as well as internet banking via CIMB One Click, Maybank2u, Hong Leong Connect, RHB Now are provided for all levels of customers who have their own preferred payment method when booking Penang to Johor Bahru bus ticket.